What's so good about TPR anyway? TPR instruction requires no translation or L1 support. It can help students and teachers make the transition to an English language environment. TPR does not depend on left-brain, “academic” skills. This gives all students a chance to shine in a new environment. TPR requires an instant reaction. As there is no time to think during TPR practice, students can break the bad habit of over-analyzing language and become more comfortable with “going with the flow”, or guessing from context. TPR does not require a spoken response from students. Also, if implemented properly, students always understand what is happening during TPR practice, resulting in increased confidence and a lowering of the affective filter. TPR can be a break for both students and teachers, a refreshingly different style of teaching. Judiciously used, it can break up a lesson or day and keep students alert. TPR results in long-term retention of language items, and the constant repetition and recycling involved reinforces this leading to a “magic” learning experience. Skillful use of TPR allows us to drill language targets repeatedly without losing student interest. Japanese students, due to teaching methods and their school environment, have tended to be strong at reading and writing English, and weak at listening and speaking. TPR addresses this by working on students' aural comprehension, at the same time as forcing them to be active listeners. TPR is perfect for team-teaching classes, as with two teachers one can serve as the model while the other calls out commands. Results come from regular, planned application. One shot lessons, while perhaps interesting or diverting, do not yield the same results as a carefully thought out series of lessons. Children are exposed to huge amounts of language input before speaking. Language learners can also benefit from following this “natural” progression from comprehension to production, instead of the more normal situation where learners are asked to produce instantly. The left brain can be described as logical, one-track, and cynical. It is used when analyzing, talking, discussing, etc. Most classroom activities in Japan are aimed at the left brain. The right brain is used when moving, acting, using metaphor, drawing, pointing, etc. It is targeted by sports and extracurricular activities in Japanese schools. When language is taught by lecturing or explaining, the cynical left brain is targeted and the information is kept in short term memory (if at all). It is soon forgotten as it never becomes “real” to the student. 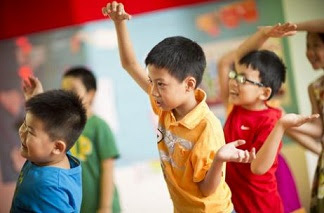 When language is taught actively through movement, the right brain “believes” the information and retains it, in the same way that skills such as swimming or riding a bicycle are remembered long term. Students learn more when they are relaxed. This is because the affective filter, a mental barrier between the students and the information, is raised when students are nervous or uncomfortable. When the affective filter is high, learners find it harder to understand, process, and remember information. TPR helps reduce the affective filter because it is less threatening than traditional language activities. Students do not have to produce language. Mistakes are unimportant and easily (and painlessly) corrected by the teacher. Language is remembered easily and long-term. It is essential to prepare a script for what you want to do, as it is extremely important not to change the language half way through. It is also important to recombine previously learned language in new ways. These factors, combined with the pace necessary for successful TPR instruction, mean that it is extremely difficult to improvise the commands. TPR instruction should be seen as a progression, with new language being added to and combined with the old every session. On a similar note, previously learned language should be reviewed and cycled into lessons constantly in order to reinforce it. While it can be useful to introduce synonyms, it is extremely important that the language not be changed half-way through a session. This is extremely confusing for students. In order for students to relax and feel comfortable, during TPR practice the teacher should project a friendly and positive manner. It is very important to limit the number of new items in order to avoid student overload and to allow students to process and absorb the language. New and old language should be manipulated in a variety of ways in order to give students a large amount of practice. Once students are used to TPR practice, introducing a limited amount of humor into the class can greatly increase students interest and enjoyment. Students should not be forced to repeat the commands or otherwise speak until they are ready. Students should not need help with the TPR commands, as the meaning should be obvious from context/the teachers' explanation/previously learned language. Translating commands into Japanese reverts to left brain input, and the benefits of TPR are lost. Student listening abilities are also not improved.